threatening to barge on through. submit it will not do. The wind is mighty and ferocious today with a temper that will not be tempered. Like a petulant child in the midst of a tantrum, it cares not who it hurts with its reckless assault, throwing things around with abandon. I dared not brave its wrath and have therefore been bound indoors. But as with all situations, I endeavoured to put it to good use and decided to make some custard. As a child my mother would purchase store-bought creme caramels that I would tip upside down before flicking a tab to release the golden syrup upon the wobbly dome. I was slightly apprehensive as to whether these would un-mould as easily and be bathed in such a generous ochre -coloured liquid, but I need not have worried, as they worked out wonderfully, and with a far more complex and palatable flavour than those bought in chilled aisles. Heat milk in a saucepan with 75 grams of the sugar, the zest and the cinnamon. Bring slowly to the boil, stirring occasionally. Remove from the heat and leave to stand for 30 minutes to infuse. To make the caramel, heat remaining sugar, salt and water in a heavy-based pan, stirring gently, until bubbles appear. Stop stirring and continue to cook, watching carefully as the liquid turns the colour of toffee. Remove from heat and carefully pour into four ovenproof moulds, swirling to coat the sides and bottom. Heat oven to 170C. Beat eggs and egg yolks lightly in a bowl. Slowly pour into milk mixture, stirring, then strain into toffee-lined moulds. Place in a baking dish and add hot water halfway up the sides of the moulds. Bake for 25 minutes or until an inserted knife comes out clean. Remove and cool, then refrigerate, covered, overnight. To serve, dip each mould into a bowl of hot water to melt caramel and run a knife around the edges. Invert onto a serving plate, allowing salted caramel to flow down the sides. total: 1hour plus at least 4hours to chill. taste: 4/5. Not your average custard. The ivory dome submits beneath your spoon as the amber nectar drenches the custard in its salt-spiked sweetness, spicy cinnamon and hint of orange bitterness. 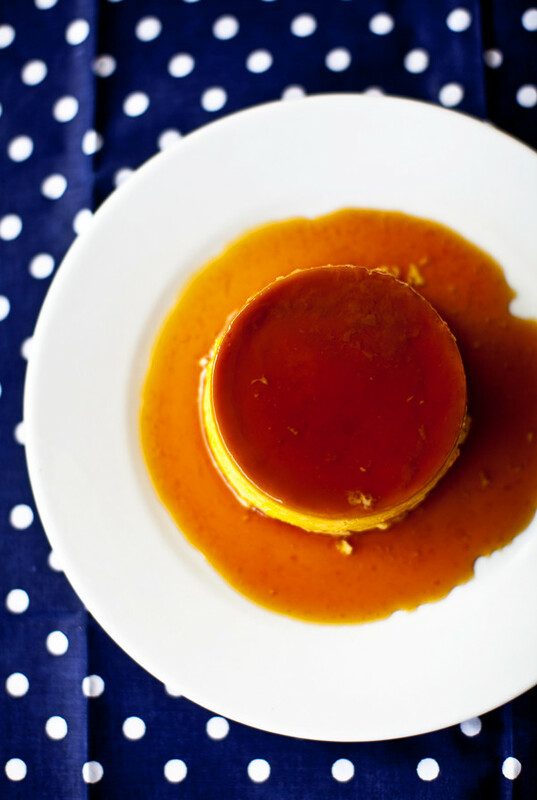 The smooth custard is mild and creates the perfect base for the zesty caramel's depth. would I make it again: No, as alas my husband would not even try one, as cold custard makes him quiver in disgust so I would rather make something we can both enjoy rather than having to eat four pots on my own, despite their deliciousness. Fabulous! A delightful dessert. I love that salted caramel. A perfect combination of flavors. This looks divine. Don't you love that salty/sweet combo? I'd be licking that plate! 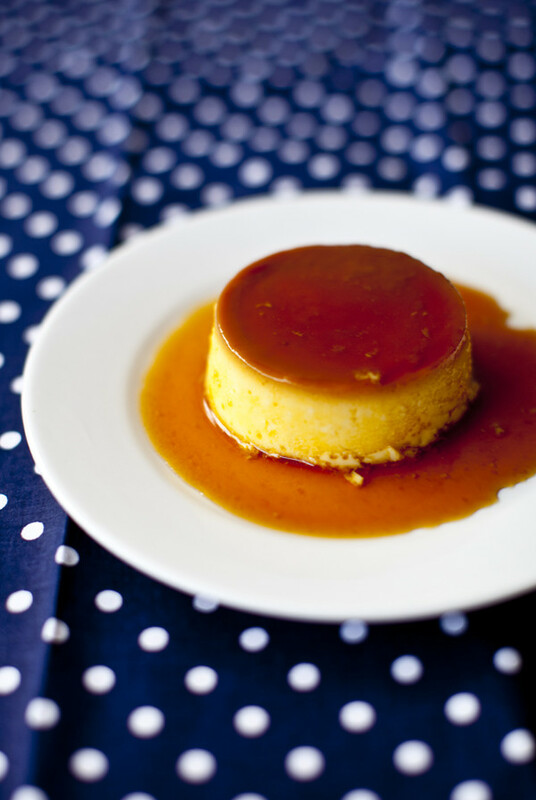 I'm so excited to see a creme caramel-esque dish without cream! I can adapt this for my lactardation, wheee! Gorgeous colors! I actually love when the wind is strong -- reminds me of the power of nature. Well I like it as long as nothing actually falls down. Last summer we had a bunch of microburst storms that snapped most of the large trees right in half all through our neighborhood. What a pretty looking dessert! Baked custards remind me of my childhood as well. I used to think of them as a real treat but not sure if I have a stomach for the store bought ones these days. Got to say I'd give these ones a go though -- the thought of the salty/sweet contrast has my mouth a-watering. swoon! i don't usually get excited about the texture of custard, but caramel is irresistible. lovely display! I loved salted caramel. I must try this!